Bilingual, cross-border, experimental chamber opera about Pancho Villa, the enigmatic general, legendary bandit, and hero of the Mexican Revolution. 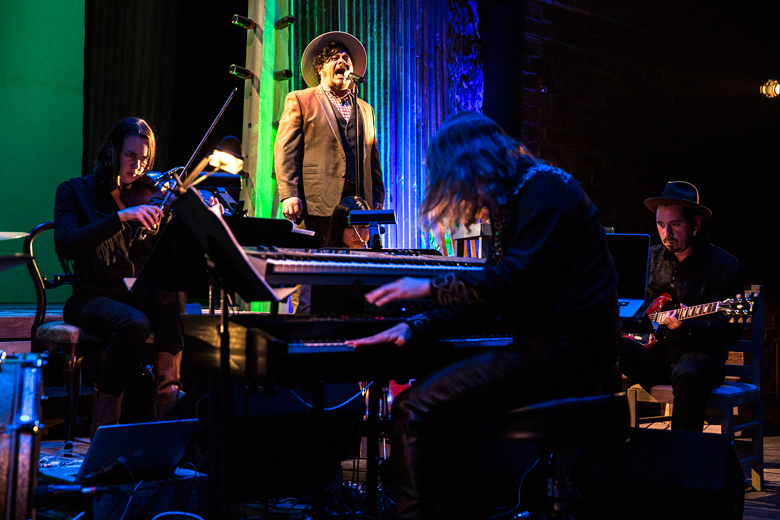 Pancho Villa From A Safe Distance is a bilingual, cross-border, experimental chamber opera about Pancho Villa, the enigmatic general, legendary bandit, and hero of the Mexican Revolution. Through a non-linear collage of scenes—from or inspired by—the life of the complex, contradictory, and controversial leader, the piece provides a timely lens into the relationships and overlaps between the communities of Mexico, the United States, and the borderlands. Originally commissioned by Ballroom Marfa and co-commissioned by Fusebox Festival, this Creative Capital Award winning project brings together an impressive array of artistic collaborators from both sides of the Rio Grande: Austin, TX-based composer Graham Reynolds, librettists Lagartijas Tiradas al Sol of Mexico City, director Shawn Sides of Rude Mechs, and an exceptional ensemble of two vocalists and six instrumentalists built around Grammy-winning producer-guitarist Adrian Quesada. New York Premiere. Co-Presented with PROTOTYPE Festival. Tickets are now on sale for this show! Originally commissioned by Ballroom Marfa and co-commissioned by Fusebox Festival.